"The Turbo Seca transforms itself from motorcycle to superbike and back again with ease, and the transformation is simply controlled by the right wrist." Hot on the heels of Honda's CX500 Turbo, the Yamaha 650 Seca Turbo, despite its futuristic looks, was something totally different. With air instead of water cooling, four instead of two cylinders, and, interestingly of all, pressurized carbs in place of fuel injection, the blown Seca took an entirely different approach to what a turbocharged motorcycle should be. Many expressed doubts as to the durability of an air-cooled engine under duress of a turbocharger; those reservations would prove unfounded (80,000+ mile Seca Turbos that have never had major engine work or even blown a turbocharger are quite common). The pressurized carbs worked very well. "Best carbureted bike I've ever ridden"- Bob Miller, President, T.M.I.O.A.). Without the Power-Up Kit it was the slowest of the Turbos, but with the Power-Up Kit installed, the Yamaha Turbo could trounce the Suzuki Turbo and be on par with a CX500TC. Disconnecting the wastegate would make it faster than the CX500TC, but slightly slower than a CX650TD and absolutely left in the turbocharged haze of the Kawasaki. Where the Seca Turbo failed was in the chassis department. 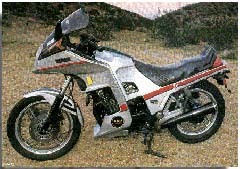 Unlike the other factory Turbos Yamaha simply used a stock XJ650 frame for the LJ -- big mistake. A little more effort in this area could have made a world of difference in handling. '82 Seca Turbos suffered from weak performance when they were initially introduced. Tired of being embarrassed by Honda CX500 Turbos in head-to-head tests Yamaha rushed out a "Power-Up" kit (free of charge!) that consisted of an inline boost pressure sensor/restrictor that fooled the turbo into thinking boost was lower than it was, and a washer that you stuck at the end of your right-side turbo exhaust muffler to increase back pressure. Both measures were designed to increase boost pressure and keep it in the cylinders longer. Peak boost went from an anemic 7 psi to a respectable 12 psi. The bad news for '82 Seca Turbo owners ('83 models came with the modification) is that Yamaha ran out of the kits in 1985. The good news is that you don't need it. Simply disconnect the vacuum hose leading to the wastegate actuator, clamp it shut, close up the hole in the actuator and experience the thrill of 14 psi. The poppet valve in the surge tank now serves as your "wastegate" to keep the engine from exploding. This also solves the problem of turbocharger wastegates failing to close, a common cause of power loss in Yamaha Turbos (blame it on the placement of the unit under the engine where it collects all sorts of road debris). The Power-Up Kit, thicker forks and a larger 5-gallon gas tank in 1983 helped sales somewhat, but a price drop to $3100 in 1984 (an '82 could be had for $2800) helped more to clear the floors of unwanted Seca Turbos. Average Seca Turbos go for $2,500-3,500. Low mileage bikes bring about $3,500 to $4,500 today. Showroom/museum examples may fetch $5,000, but Seca Turbos in such a state are extremely rare. '83 models, with their 1mm thicker forks and 1 gallon larger gas tanks may bring a bit more.